Everybody loves a late, lazy brunch on the weekends. This classic recipe is updated a bit with salmon and horseradish; a classic combination for a special meal. Over medium heat sauté onions until just soft and set aside. In a medium bowl combine Salmon, Herbs, Onions, Dijon and Egg and mix well. Add Breadcrumb and mix until evenly combined. Form into cakes and Refrigerate 30 minutes-2 hours. Preheat oven to 375 degrees while cakes are setting in the fridge and prepare a baking sheet with cooking spray and parchment. Bring a skillet up to medium-high heat and in batches brown both sides of each cake. After browning the cakes place on prepared baking sheet in the oven. Put enough water into a large sauté pan to come up 2 inches in the pan. Add 2 Tablespoons white vinegar. Bring the liquid to a simmer. Begin to toast English Muffins and prepare Hollandaise (recipe below) before moving forward with the eggs. Poach the eggs in a batch, no need to stir water when preparing more than a couple at a time. When fully cooked removed with a slotted spoon and drain on paper towels. 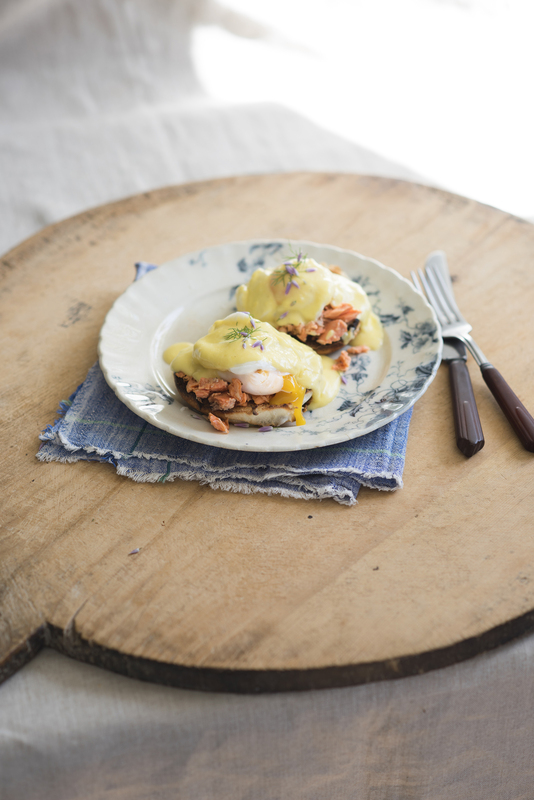 Layer each half of English muffin with 1 prepared salmon cake, a poached egg and 1/8 of the hollandaise. Garnish with fresh dill and chives. Fill Blender with Hot Water and after allowing to heat up a bit empty and dry completely with a towel. Add Eggs, Lemon juice and Horseradish and Blend until combined. With blender running slowly add hot butter until thick, creamy sauce forms. Season with salt and pepper and serve immediately.